27 Apr The first bluebells…hurrah! Taking my children to school yesterday I saw the first bluebells of the season in flower in the woods. Ah my heart soared instantly! There is something special about the bluebell which brings smiles to faces and a sort of sigh, to people’s voices and a dreamy eyed look to their faces. There are certain sights which we think of as being quintessentially English and I believe a woodland carpeted in bluebells and wild garlic in spring is one such sight. On certain days when bright clear light falls through the gaps in the woodland canopy, the immense intensity of vibrant fresh greens mixed with the deepest of indigo blues is breath-taking and magical. And the subtle scent is unlike any other. Although we know approximately when certain plants and flowers will bloom each year, nature and weather are always firmly in charge and there can be a little variance. It is a slightly later start to the bluebell season this year. I never feel this matters. There is always something to enjoy in the countryside! 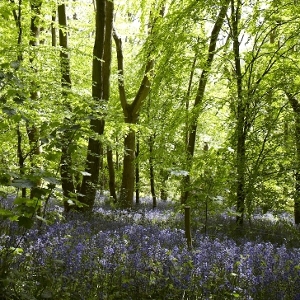 Most bluebells are found in our ancient English woodlands. We call those ancient which date back to the 17th century. Bluebells have been around a long time. Here are some fascinating bluebell facts! In the bronze age people used a bluebell glue to attach feathers to their arrows. Bees can “steal” nectar by biting a hole in the bottom of the bell to reach the nectar! 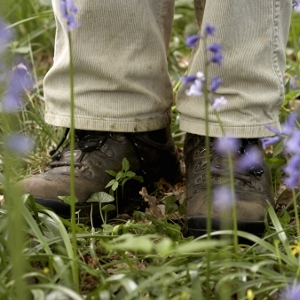 And if you find yourself yearning for both fresh air and bluebells, take a look at our incredibly special new Bluebell Trail in South Wiltshire. With prices from £258 per person including a bottle of Champagne it’s a great way to celebrate and enjoy the spring! Hurry! Breaks are available for a few weeks only. You can read all about it using the link below. And enjoy some more photographs. Give my love to every bluebell you see … after last year’s marvellous experience they will stay in my heart forever.